In a nostalgic look back at the rowdy days of roller derby, Lee Cowan visits with the "meanest mama on skates" and reports on the emerging popularity of the sport's reincarnation. Tucson Roller Derby’s VICE Squad dominated Arizona Roller Derby’s Surly Gurlies in the first inter-league bout of 2005 held May 21. The final score of 102 – 43 belied the hot and heavy action happening on the floor throughout this fight-filled bout. Jammer takedowns, mangled star passes and a frequently-visited penalty box were all heavily featured throughout the night. Clips are in two parts for easy download, compressed for quick web viewing, and play in QuickTime. Footage and editing provided by BitClone. Congressional Democrats accused the US government environment body yesterday of opening the door to tests of pesticides on humans that "appear to routinely violate ethical standards". The Democrats issued a report saying that, since lifting a moratorium on human testing imposed by the Clinton administration, the Environmental Protection Agency (EPA) had accepted for review more than 20 studies on the effects on human subjects of "highly hazardous" poisons and suspected carcinogens. The congressional report was sponsored by Barbara Boxer, a California senator, and Henry Waxman, a congressman from the same state. They said it had uncovered "significant and widespread deficiencies" in 22 human pesticide experiments it reviewed. "In violation of ethical standards, the experiments appear to have inflicted harm on human subjects, failed to obtain informed consent, dismissed adverse outcomes and lacked scientific validity," the report found. "In many of the experiments, the subjects were instructed to swallow capsules of toxic pesticides with orange juice or water at breakfast." The "informed consent" forms were often loaded with jargon, hard to understand or deliberately misleading about potential health risks. Some studies dismissed unfavourable results. In one test, all eight subjects became sick after exposure to a pesticide, but in the report their symptoms were discounted and attributed to "viral illness". The General announces "OPERATION YELLOW ELEPHANT" just in time for the 56th College Republican Biennial Convention next week in DC. The Rude Pundit also has a few encouraging words for those attending the event. The flat track Carolina Rollergirls third bout of their inaugural season is on Sunday, June 19th. The Debutante Brawlers skate against the Trauma Queens. Music by The Bleeding Hearts, DJ Cutlass and DJ Exe. The flat track Tucson Roller Derby skates this Saturday, June 18th. 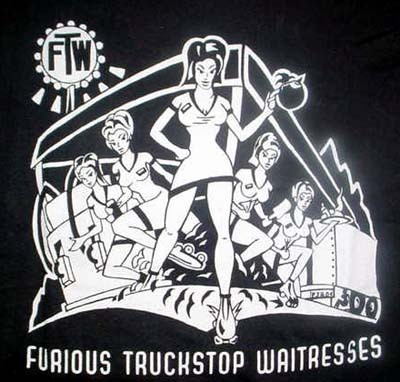 Das Iron Curtain duke it out with the Furious Truckstop Waitresses. UPDATE: Action is still needed. Congressman John Conyers now has over 100,000 400,000 signatures and has set a goal of 250,000 500,000. The flat track Gotham Girls Roller Derby will bout in the Bronx this Friday, June 17th. The new team on the rink, the Queens of Pain will take on the Manhattan Mayhem. Please check the Gotham Girls Roller Derby website for more info.